An Indiana University graduate celebrates with confetti flying on campus. In 2017 I photographed Lisa's wedding and it was great to see her again on the campus of Indiana University Northwest for some Lifestyle Portraits to celebrate her graduation. We met up in the Savanna building and gradually made our way outside for the big confetti finale. An Indiana University graduate on the IU runway. Lisa was decked out in IU red and a crew of friends who helped with the many props. We took portraits in the lounge with the piano with and without cap and gown. Portait at the piano inside the IU Northwest student lounge. Headshot portraits of a graduate at Indiana University Northwest. 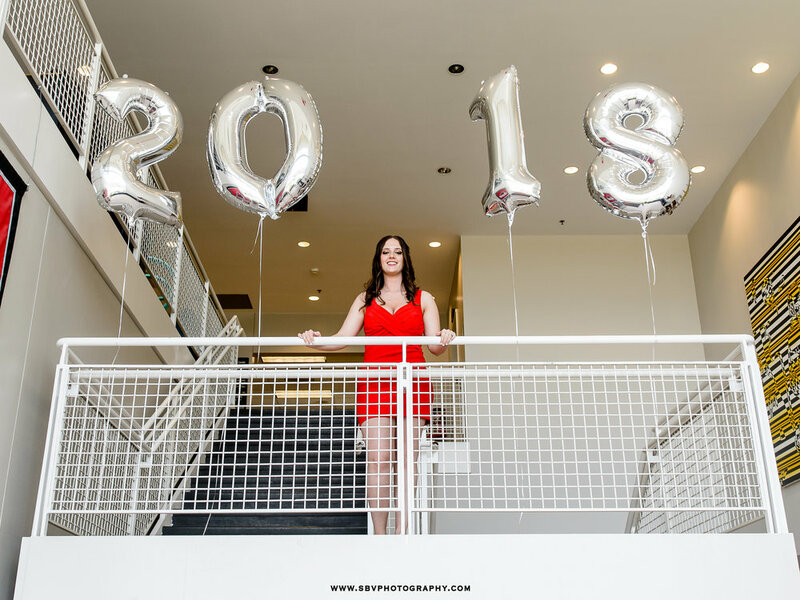 2018 balloons hover above the IU graduate. Lisa - IU graduate, at the piano. Roaming the halls of Indiana university Northwest in Gary, Indiana. Once we headed outside things got a little messy with confetti and balloons being cast to the sky. It was a good time. I'm sure we attracted a lot of attention to ourselves as the balloons floated high above and the confetti cannons were fired. Indiana graduate blows confetti from her cap. Walking the steps toward IU with cap and gown. We couldn't resist the colorful red and yellow flowers for a beauty portrait as the sun set it's golden glow upon us. Portrait among the red and yellow flowers at Indiana University Northwest. Balloons are released in celebration by an Indiana University graduate. I hope you have enjoyed this sneak peek Lifestyle Portrait Session at Indiana University Northwest. To inquire about your own portrait or event session, please fill out the Contact Form. Rina had gotten a hold of me and said she needed some posed family photos along with lifestyle photos in honor of her Dad's birthday. I met them at Centennial Park on a gorgeous summer day. We started on one of the famous Centennial Park bridges and then we visited the lovely garden area. In the garden we did a few different groupings and even some couples portraits. Brother and sister portrait at Centennial Park. Family photo in the garden at Centennial Park. With all of our posed pictures done, it was time to break out the bubbles!! The kids had a ball running as did I photographing them. Lifestyle children's photos with a bubble machine in the park. Family lifestyle pictures at Centennial Park. I hope you have enjoyed this sneak peek look at Summer Family Photos at Centennial Park in Munster. Be sure to fill out the Contact Form to inquire about a session of your own. Family photo on the bridge at Centennial Park.